Click on (Enlarge) for underhood image. 2 year warranty to original buyer. Master Cylinder is New with New Reservoir (White). Vacuum tee is Stainless Steel and not plastic. Pedal has been cleaned, painted with zinc chromate then painted with Rustoleum Black. Big end has been cleaned and lubed. Ready for installation. Including Bolt, Nut, Plastic Bushings and Metal spacer. In stock for immediate shipment. Shipped USPS Priority or UPS Ground. Your choice. This Kit is a Bolt In. No Cutting. No Drilling. line for booster vacuum. Tee and vacuum line included. This is detailed in the instructions. Master cylinder bore size is the same size as the Powermaster. No need to change proportioning valve. I know of 2 Turbo Regals with rear disc brakes with this kit. out of the rear of the booster body. pedal will be low and hard. The booster is 9" dual diaphram type. under the hood of a Turbo Regal. 1986 & 1987 Powermaster replacement. 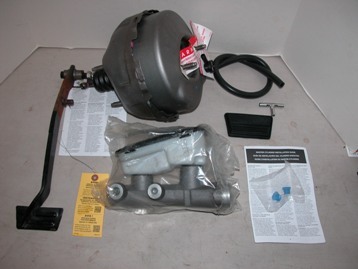 Replace the entire Powermaster with this vacuum brake kit. The brake pedal must changed which is included. Booster is freshly rebuilt by Cardone and unpainted. Booster comes with the one way vacuum fitting on booster. Master cylinder is new with new good looking brake fluid reservoir. I have heard the argument that a non Powermaster brake unitwill decrease the value of my Turbo Regal. Powermaster fuse and having no brakes and no more T or GN. qualified mechanic install this kit. Powermaster motor is like stepping on a brick. Much worse than a vacuum system when the engine dies at speed. use vacuum brakes from the factory. not necessary on the turbo car.